Summary: Microsoft Scripting Guy, Ed Wilson, talks about using Windows PowerShell to find files modified by month and year. Microsoft Scripting Guy, Ed Wilson, is here. I will admit it. I am not the best computer user in the world. In fact, when it comes to finding things on the Internet, the Scripting Wife often is faster than I am. In my office, often the Scripting Wife sits beside me and does whatever she does. At times, I will ask her to find something that I have wasted 15 minutes seeking, and she can find it almost immediately. A case-in-point is Windows Search. I modified the indexing to include the full contents of my Windows PowerShell script files, and it works great. However, one thing I have not figured out used to be very easy in the Windows 95 days by using the old-fashioned Find utility—that is to find a file by date. When the Scripting Wife and I were in Montreal, Canada last October, I remember writing some additional Windows PowerShell labs for the class. In fact, I spent each day teaching the class, the evenings with friends, and the nights writing new labs for the coming day’s class. After spending 15 minutes attempting to browse and search for these files, I finally gave up. I was unable to find my new lab files. OK, so maybe I am not the world’s greatest computer user, but I know Windows PowerShell really well. The neat thing is that because I do know Windows PowerShell so well, I can compensate. For example, to find my missing lab files, I use the Get-ChildItem cmdlet and search my Data directory. In addition, although I cannot remember if the files have a .doc or the newer .docx file extension, it really does not matter. Because my Data folder is deeply nested, I need to do a recursive search. The following command returns all .doc and .docx files from the Data directory on my computer. The next thing is that I know I modified the file during the month of October in the year of 2011. The cool thing is that the LastWriteTime property is an instance of a System.DateTime object. The following script illustrates this. Because the LastWriteTime property is an object, it means that it has a number of different properties. These properties are shown here. Based on the information detailed above, I can easily look at the month and the year that file modifications took place. 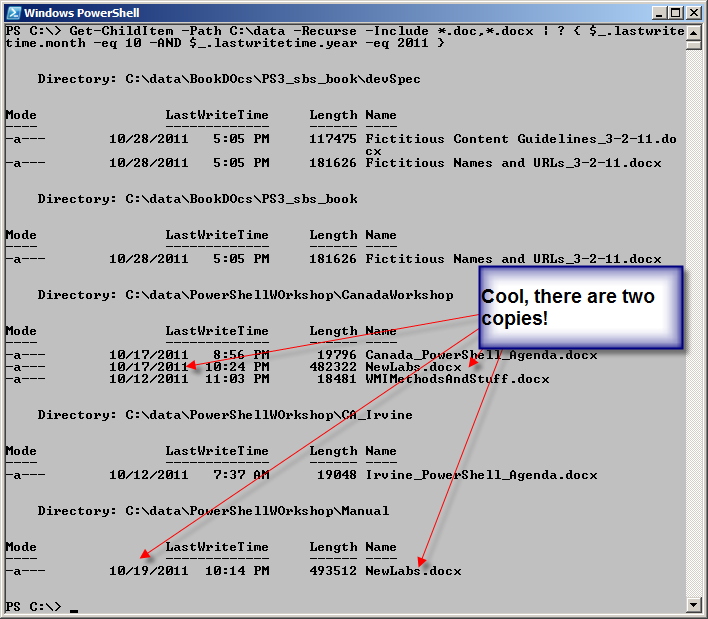 Therefore, I need to use the Where-Object to examine the month and year properties of each file. This is a perfect place to use the “double-dotted” notation. The first dot returns a System.DateTime object. The second dot returns a specific property from that DateTime object. The following code first returns the month the file was last written, and the second example returns the year that the file was modified. If you get really good with Windows PowerShell, you improve more than just your system admin skills. Personally, I use Windows PowerShell every day; and these days, I do not do that much actual system administration. I love the Windows Search tool, and I am certain it could help me find files that I modified in October of last year. But it actually took me less than a minute to whip out the command, and it worked the very first time I ran it. Not only that, but the command is pretty fast as well. So given that I can find stuff in less than a minute, it does not really pay for me to spend hours trying to find out how to search by “date modified.” Windows PowerShell makes it easy. Join me tomorrow for more Windows PowerShell cool stuff.